Ibarbag is a business that was founded by a 80’s and 90’s generation group who are about making things like they used to be made. They focus on classic old school style and take pride in their products durability and attractiveness. The Ibarbag small canvas shoulder bag is one of the hottest and most popular shoulder bags on the market right now. This thing has a classic vintage look that is perfect for both men and women. So let’s get to the details and see what this review has to say. Let us take a closer look at the Ibagbar small canvas shoulder bag. It is a very popular bag in general not just a shoulder bag. It also looks great for both men and women, so there is no reason why you can’t pick this up for someone of either gender or just for yourself. 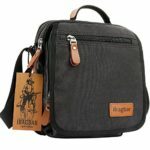 The Ibagbar small canvas shoulder bag is a great looking shoulder bag. It has a smaller frame so it doesn’t resemble a messenger bag as much but more like a satchel. It also comes with a couple selections of color for you to choose from. There is a brown, black, dark grey and blue version for you to choose from. This small canvas shoulder bag by Ibagbar is well made with a sturdy cotton canvas that looks great. It has the leather logo Ibagbar stitched onto the front side of the shoulder bag in the lower right corner and also uses leather for the zips. This incredible looking bag also uses leather for the handle so it keeps with the overall appearance. 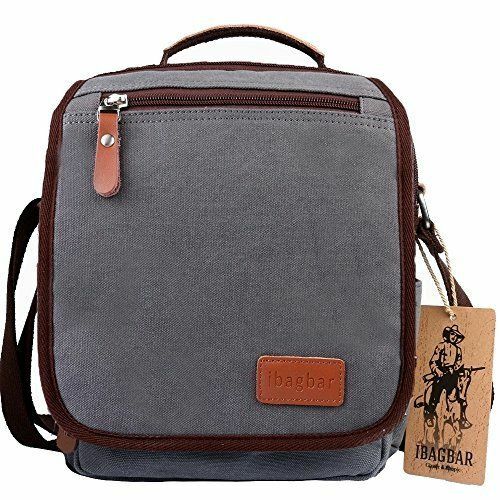 As far as style for the Ibagbar small canvas shoulder bag goes, it’s great for both men and women, has a couple of different colors to choose from and looks great with a cotton canvas and leather mixture. However, I would have liked to have seen a few more options in terms of color for people who want to stand out a little bit more. For these reasons I give the Ibagbar small canvas shoulder bag a solid 4 out of 5 stars. When it comes to comfortability with regards to the Ibagbar small canvas shoulder bag, there isn’t much to say except it feels just fine. The reason being is twofold. Reason number one why this bag is comfortable to carry around is the fact that you can either use the leather handle or a shoulder strap, you know, because this is a shoulder bag. So if you’re in a crowded place and want a good grip on your bag you can hold onto the handle or if you happen to be riding your bike around town, you can just throw this over your shoulder. On top of this the shoulder strap is adjustable to a full extension of 75 cm. This allows you to make adjustments so that it can fit you just perfectly. The second reason why this small canvas shoulder bag is very comfortable to carry is because it is small and light. Now don’t get me wrong you can certainly pack quite a bit into this small canvas shoulder bag but it’s not as large, heavy or cumbersome as some other shoulder bags would be. There’s not much to mention with regards to the comfortability of the Ibagbar small canvas shoulder bag because it’s relatively straight forward, it’s light and it’s adjustable. Therefore I would put this bag at a 5 out of 5 stars with regards to its comfort. The durability of the Ibagbar small canvas shoulder bag is fairly impressive. 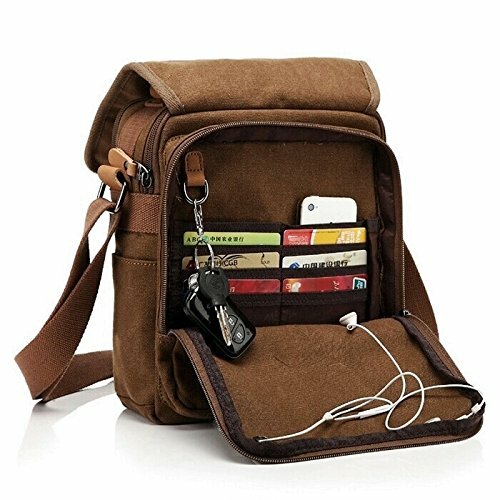 It is a very durable shoulder bag for the fact they use a high density canvas along with the leather to withstand a beating. Along with this there is a subtle but important feature. The stitching on this small canvas shoulder bag is very well done and I don’t see any signs of weakness or issues coming about from normal wear and tear on this bag. Now obviously you can’t overstuff this bag with the heaviest of items but with reasonable use and care, I don’t see this bag breaking down anytime soon. One of the ways you can ensure that it lasts you for years to come is to maintain and wash this bag as needed. You simply wash it with room temperature water and no alkaline detergent, separate from other items and then let it hang dry. It will be as good as new. The last point I want to make about the Ibagbar small canvas shoulder bag is something that I love to see with any product. 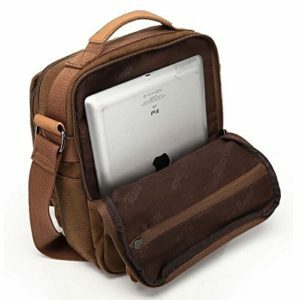 Ibagbar provides a 1 year warranty on all of their products, including this shoulder bag. If there are any problems with the bag, you simply contact them and they will solve the problem for you. You have to love warranties! With regards to durability the Ibagbar small canvas shoulder bag provides as much durability as you would expect. It is created with a highly durable canvas construction along with leather thrown in. It has great stitching and can also be washed to be made to look like new. And to top it off, Ibagbar provides a 1 year warranty. With all of this taken into consideration and the fact I don’t see this bag losing its integrity anytime soon, I give this bag 5 out of 5 stars for durability. Functionality is by far my favorite aspect of any product review. I love to go over all of the nooks and crannies and explore what the product really has to offer. Without further delay let’s get into the juicy details about the Ibagbar small canvas shoulder bag. To start, let’s talk about the size of this bag. It is fairly small unlike the Ibagbar satchel shoulder bag. It looks small, it weighs very little and it supposedly has a small capacity but looks can be deceiving. This bag can actually fit quite a bit of stuff, so don’t let the small capacity fool you. It comes in at 10 inches in length, 11 inches in height and 5 inches wide. Now realize that these dimensions are for the outside of the bag, it may be somewhat smaller on the inside. It may not seem like a lot but this bag is set up to be very organized to maximize its capacity. Speaking of which, let’s talk about that. This shoulder bag may appear small but with this bag there are a total of 9 different pockets. Ibagbar somehow managed to provide us with 2 side pockets without zippers, as well as, 7 zippered pockets. It can store up to 8 credit cards, has a place for your key chain, a slot for pens and finally it has a hole with a grommet so that you can run a pair of headphones through. Alternatively you could also run a charger through there while in the car if you wanted to charge something in your bag while driving. 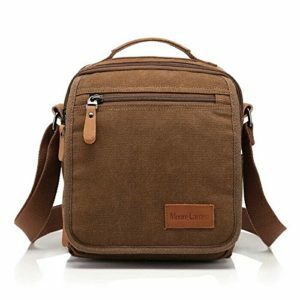 On the front side of the small canvas shoulder bag it has a flap that folds over a zippered compartment which is held in place by Velcro as well as any items you hold in the flap, as it too has a zippered compartment for storing items. On the back side is another zippered compartment that when opened can easily hold your iPad if you wanted to take it along with you. One thing to note about this small canvas shoulder bag is that it is not water resistant. Sure it can shed some water but it will eventually become soaked as it is made of a cotton canvas. With the functionality of this Ibagbar small canvas shoulder bag laid out in front of us you can see there are many features to this product. The way the pockets are designed and laid out to optimize capacity are very well done. The ability to fit tablets and such in this bag makes it great to keep connected to your favorite devices and not to mention the fact it has an opening to use headphones or chargers while the bag is closed. However, the inability to be water resistant and the fact that it is smaller than expected can cause some very slight concern. 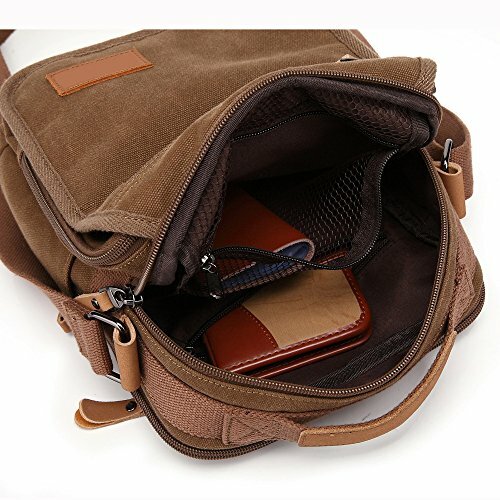 For these reasons I give the functionality for the Ibagbar small canvas shoulder bag 4 out of 5 stars. With all the details of the Ibarbag small canvas shoulder bag poured through, we can get a good idea of what this bag has to offer. It certainly is an impressive bag and one that I have thoroughly enjoyed reviewing. This bag does come with some very small setbacks. Unfortunately the bag is a bit smaller than expected but fortunately I did not have an issue with the smaller space. The small canvas shoulder bag also is not water resistant which may be a concern for some and finally I would have liked to have seen a few more options for different colorful variations. That’s not to say this shoulder bag doesn’t have its strengths where this bag really shines. It has a great vintage style with a couple of options for colors and is made with a sturdy cotton canvas and leather zips. It is very light and extremely comfortable to carry, as you can also adjust the strap to meet your preferences. It also uses great organizational features to maximize what you are able to carry. With all of this taken into account and the fact the price is extremely attractive I would give this bag 4.5 out of 5 stars and one that I highly recommend for anyone, both women and men. If you have a different opinion or want me to review something else, feel free to leave a review or comment below!